I was recently wondering what the year 1991 was good for (most of the early 90s, for that matter). Oh yes, I started with an interesting new movie-review publisher – who immediately went out of business. Later, I found out they had started up again and neglected to tell me. When I finally tracked them down and re-introduced myself, the reaction was more or less, “yes, you still work for us. We’ve been waiting to hear from you - what took so long?” Believe it or not, they weren’t even a Cleveland publisher, despite that management style, a bit too familiar in my flatlining career. But 1991 also stands out, for many other moviegoers, for when the international release (pushed heavily by Terry Gilliam; I remember the Cleveland International Film Festival premiering it here) of the French science-fiction satire hit DELICATESSEN. It brought to wide attention the filmmaking duo of Jean-Pierre Jeunet and Marc Caro, who went for some time simply by the tandem credit Jeaunet-Caro, with their Tim Burton-esque (or Gilliamesque) eye for grotesque fantasy, but in a mildly European fairy-tale/fantasy vein, mixing menace with whimsy and a hint of the unspeakable in a recipe that is all their own. I feel their subsequent CITY OF LOST CHILDREN was the duo’s masterpiece, but some prefer DELICATESSEN. In a dusty, rust-colored landscape - maybe the aftermath of nuclear war or other global environmental disaster - on the outskirts of Paris, a semi-ruined apartment tenement stands with a delicatessen on the first floor run by the burly butcher-landlord Clapet (Jean-Claude Dreyfus). With livestock and crops apparently extinct, people in this struggling society subsist on either hoarded grains or by eating other people. Clapet's solution: He continually lures job-seekers to work as handymen, whom he soon murders to turn into the meat served to the building's weird mini-community of tenants. The latest applicant to Clapet's want-ad is Louison (Dominique Pinon), an impish, almost Chaplinesque ex-circus clown, tragically unemployed since his chimp partner was killed and eaten after their act. Louison's good nature and talents endear him to the tenants, especially Clapet's estranged, adult daughter Julie (Marie-Laure Dougnac). She contacts a sewer-dwelling anti-cannibalism resistance (underground resistance, get it?) to rescue the innocent clown before he becomes a morsel. Marc Caro cameos as a member of the strikingly rubber-clad but bumbling vegetarians, while Euro-horror actor of yesteryear Howard Vernon also has a small role – reminiscent of the abovementioned Burton’s fondness for giving parts to Vincent Price and Christopher Lee. Maybe in some even worse alternate universe than this one Tim Burton dared to remake DELICATESSEN with an English-speaking cast. He need not have, of course. The Jeunet-Caro version, spare on dialogue, is all that any viewer needs, with its richly desolate textures, sense of physical/social decay and effective satire on what happens when the dog-eat-dog world becomes a human-eat-human world instead. Meanwhile, everyone tries to pretend everything is normal and under control, and the not-unsympathetic Clapet registers some pathos himself as he strives to rationalize that, despite being a cleaver-wielding serial murderer, he really isn’t a bad person after all. 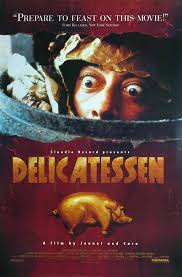 DELICATESSEN probably deserved a PG-13 so much more than the R-rating it got slapped with by the American imperialist pig-dog MPAA. The loose-jointed plot often turns to people doing (or being) puzzling things, like Vernon’s weird old man in the building's flooded basement reigning over colonies of frogs and snails, or a last-minute revelation that a motiveless murder plot had been afoot all along concerning two minor characters.